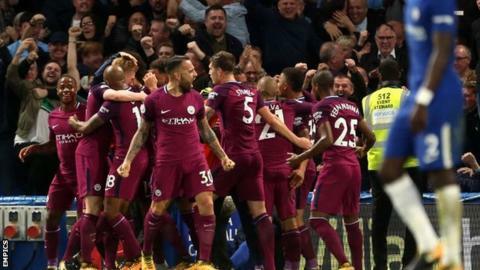 The top three all won in the Premier League on Saturday as Manchester City defeated Chelsea in the late game to reclaim the top spot that had briefly been taken away from them earlier in the day. Kevin de Bruyne smashed a stunning second-half strike past fellow Belgian Thibaut Courtois as Manchester City leapfrogged Manchester United on goal difference with a slender 1-0 victory. United had earlier gone top and extended bottom side Crystal Palace's miserable start to the season with a routine 4-0 victory at Old Trafford. Juan Mata's third-minute strike, plus two goals from Marouane Fellaini and Romelu Lukaku's late tap-in, ensured the Eagles have now lost their first seven league matches of the season without scoring. Including their defeat on the final day of last season, that's 720 minutes without a top-flight goal. Harry Kane is having no such problems. He took his total to 13 goals in eight matches in September as Spurs thrashed Huddersfield 4-0, making it the most prolific month of the England striker's career. That tally matches the best efforts of Barcelona's Lionel Messi (13 in March 2012) and Real Madrid's Cristiano Ronaldo (13 in October 2010). Peter Crouch scored a late winner for Stoke against Southampton, for whom Virgil van Dijk conceded a penalty on his first start of the season. That spot-kick was missed by Saido Berahino - taking his goalless run to 31 hours and 48 minutes - but the Potters still managed to run out 2-1 victors. Watford snatched a point at West Brom, Richarlison's injury-time strike securing a 2-2 draw for the Hornets and extending their unbeaten away record. West Ham are out of the bottom three after Diafra Sakho's last-gasp winner earned them a 1-0 victory against Swansea, while the game between Bournemouth and Leicester, two of the bottom four at the start of play, ended goalless. In Scotland, champions Celtic remain unbeaten but they left it late to salvage a 2-2 draw against Hibernian. Second-placed Aberdeen moved level at the top with a 3-0 victory over St Johnstone. Catch up with all the day's Scottish football here. In the Championship, Wolves were among the big winners of the day, moving up to second with a dominant 4-0 victory at Burton. Hull thrashed Birmingham 6-1. We've got reaction to all of the EFL matches here.